Pauline Rosenfelder came to America with her parents in 1909 and Married William Krausz 30 Jan 1910. Built by Schichau Shipyard, Danzig, Germany, 1900. 13,182 gross tons; 581 (bp) feet long; 62 feet wide. Steam triple expansion engines, twin screw. Service speed 15 knots. 788 passengers (299 first class, 317 second class, 172 third class). Built for North German Lloyd, German flag, in 1900 and named Grosser Kurfuerst. Bremerhaven-New York and Bremerhaven-Australia service. Laid up at New York 1914-1917. Seized by United States Navy, American flag, in 1917 and renamed USS Aeolus. Transferred to the US Shipping Board in 1919. 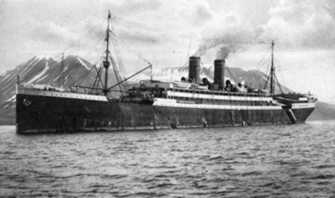 Chartered by Los Angeles Steamship Company, in 1922 and renamed City of Los Angeles. Los Angeles-Honolulu service. Laid-up 1933-37; scrapped in Japan in 1937.